The New England Historical Association (NEHA) is a regional affiliate of the American Historical Association and includes over 500 scholars working in all branches of history. Formed in 1965, its purpose is to promote scholarly interchange and to enhance teaching and scholarship in history. While most of its members are college and university faculty, its active participants also include graduate students, independent scholars, preservationists and museum-based scholars, historical society administrators, and secondary school faculty. Everyone interested in the scholarly pursuit of history as an academic, public, or avocational historian is welcome to join NEHA. Annual dues (for one calendar year) are $30 ($15 for graduate students, adjunct and emeritus). To join, click here to go to our registration site. The main activities which NEHA members share are the Spring and Fall meetings. Normally these are one-day (Saturday) meetings, with scholarly papers and comments presented at six or more morning sessions and either afternoon sessions or a plenary session. Younger scholars, independent scholars, and graduate students often participate in panels. In addition to a formal session, members have ample time to converse informally during coffee breaks and luncheon. There is also a book exhibit. Scholarly sessions last either 90 or 120 minutes and follow the general format of AHA sessions, with papers and comments followed by discussions among panelist and the audience. Sometimes other formats are used, such as panel discussions, workshops, or a single longer paper with comments. While its meetings are similar in quality to those of national associations like the AHA and OAH, NEHA offers several distinct advantages. First, it is accessible. Junior scholars, independent scholars and doctoral candidates can often participate in panels and are invited to plan sessions and submit them to the program chair. Established scholars who are presenting an early version of a forthcoming publication also have access to the program. The fact that NEHA meetings are usually within easy driving distance and only require the commitment of a Saturday makes them more accessible and affordable than national meetings. Second, NEHA operates on a human scale. Meetings normally include 75-100 people, and it is easy to meet and converse with others who share interests. Considerations of rank and status are subordinated to scholarly and collegial concerns. Thirdly, NEHA offers a wide variety of sessions on topics in all historical specializations in Europe, Africa, Asia, Oceania, Latin America and North America. Some sessions will directly address members’ teaching or research interests whereas others will relate to more general interests. Past plenary speakers have included Erik Erikson, E.J. Hobsbawm, Lawrence Stone, and Norman Cantor. NEHA meetings make for an intellectually stimulating day and a valuable professional experience. NEHA receives no grant or external funding, so we rely entirely on membership dues and meeting registration for our operating funds. Please support history and scholarly excellence in our region by becoming a member. Twice each year, in the Spring and Fall, NEHA mails its newsletter to members and subscribers and posts it online. 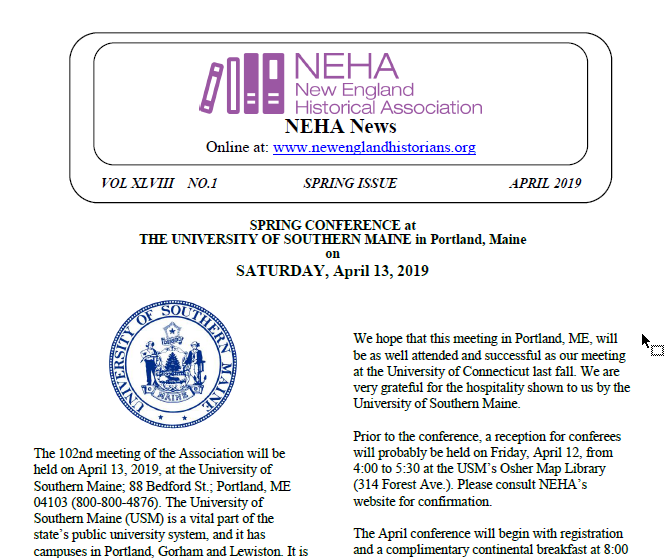 The NEHA NEWS publishes the forthcoming conference’s preliminary program and reports of the association’s business in addition to professional news, notes on the activities of members, ballot for the spring election, and a calendar of future scholarly conferences for various associations of interest to historians. Download a PDF of the current issue here. NEHA awards two prizes. The James P. Hanlan NEHA Book Award is given annually to a New England author of a book on any historical topic. Publishers are invited nationally to submit one book for the competition which is judged by a committee of NEHA members. The NEHA Graduate Student Paper Award is presented for the best paper presented by a graduate student at the previous year’s conferences.